With three short films and a few extra features, Paul McCartney: The Music and Animation Collection DVD seems a little sparse. But Tropic Island Hum, Tuesday and Rupert and the Frog Song, each about 12 minutes long, feature high quality animation. The second two titles have the look and feel of the children’s books on which they were based. Kids who are too young to know who McCartney is will enjoy these films, and their parents will too. Kids too young to know who McCartney is will enjoy these films, and their parents will too. Rupert and the Frog Song won a British Academy Award in 1985 and Tuesday was nominated in 2002. Made in 1997, Tropic Island Hum begins with a squirrel escaping some hunters in a hot air balloon piloted by a three-legged frog (he had a run-in with some French chefs). They land on a tropical island animal sanctuary, where the residents have a party and sing the title tune, which was written by McCartney. The animal rights message — a cause embraced by McCartney and his late wife Linda — is obvious, but not overbearing. Of the three films, this is the cutest and most Disney-esque. Tuesday, based on a children’s book by David Weisner, begins in a swamp on “Tuesday evening, around 8.” Some frogs unexpectedly levitate on their lily pads. They fly into town and have adventures while the human population sleeps. With its pensive score, written by McCartney, and its slower pacing, the experience of watching this film is closer to looking at the book, than it is to watching the typical animated fare on television. This visually inventive film is the cleverest of the three shorts. The third film, Rupert and the Frog Song, features Rupert Bear, a beloved British storybook and newspaper cartoon character. Young Rupert, who looks like human with a bear’s head, heads off into the country to play. He follows some frogs to their secret lair, and is privileged to witness a fantastic symphony and ballet performed by the frogs. Rupert also has moments of visual inventiveness, like a tree whose leaves turn out to be a mass of rainbow-colored butterflies. At first glance, the DVD seems like a vanity project for McCartney. To his credit, he seems to care about the quality and was willing to spend the money to get it. The animation is hand-drawn, with computers used only for coloring. McCartney also took an active role in making the films, composing all of the music, providing most of the voices and even helping out with some of the live action modeling. 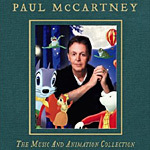 The DVD includes a brief interview with McCartney, in which he talks about how he got interested in the subjects for the three films and his fondness for hand-drawn animation, among other things. All three films are presented in widescreen in their 1.85:1 aspect ratio. The high quality of the hand-drawn animation is evident. The colors are as bright or as muted as the moods of the films. The Dolby Digital 5.1 surround sound is subtle, but noticeable. It is especially evident in Tuesday, giving the sensation of being surrounded by croaking, levitating frogs.